Through a statement on their official website, EFL Championship side Ipswich Town have confirmed the signing of Nigerian midfielder Tayo Edun on a season-long loan from Premier League new boys Fulham. The 20-year-old's paperwork has been completed and he is available for selection in The Blues Championship opener against Blackburn Rovers on Saturday. Edun has made seven appearances for the first team of Cottagers since making his professional debut in a League Cup match against Leyton Orient. He was a very key member of the England U19 squad that won the 2017 UEFA European Under-19 Championship, and was included in the Team of the Tournament. 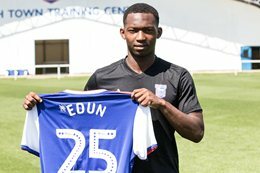 During his time at Portman Road, Edun will wear the number 25 jersey, made popular in Nigeria by Arsenal legend Nwankwo Kanu. He joins defender Josh Emmanuel, midfielder Tom Adeyemi and young striker Ben Folami at Ipswich Town.